If it wasn’t bad enough that sugar wreaks horrors on our health (diabetes, Alzheimer’s, mood swings, candida, hormonal balances, cholesterol… anyone?) research now shows that it’s terrible for our skin as well. An excessive intake of processed sugars can fast track the aging process, leading to dark circles, wrinkles, fine lines and loss of radiance. Sugar leads to premature ageing: When sugar enters your blood stream, it binds to proteins in a process called glycation. Glycation destroys collagen and elastin (skin’s building blocks), thereby leading to wrinkles and sagging. Sugar breaks down antioxidants: This breakdown in proteins and collagen also weakens the body’s natural antioxidants, leaving it vulnerable to all kinds of environmental damage. Sugar increases dark circles: The process of glycation produces toxic compounds called Advanced Glycation End Products (commonly shortened, appropriately, to AGEs) that are responsible for dark under-eye circles, yellowing of skin and dullness. Sugar suppresses the Human Growth Hormone (HGH): HGH helps regulate body composition, muscle and bone growth, fat metabolism and even the heart function; low levels make you look and feel older. 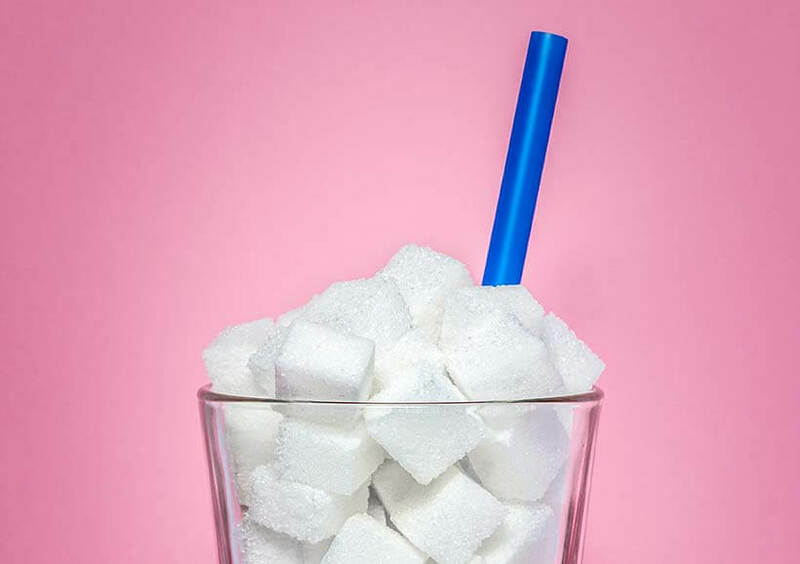 Sugar leads to chronic inflammation: A diet high in sugars is associated with inflammation, which leads to all sorts of skin and health issues (like loss of skin elasticity, broken capillaries and breakdown of cells). The result? Fast track ageing. Sugar decreases the lifespan of skin cells: The sudden spikes in energy intensify the activities of cells and tissues, making them divide more rapidly and thereby decreasing their lifespan. Sugar causes acne: Finally, sugar can also contribute to acne flare-ups, since they rev up all the body’s functions, including oil production. Ideally we should eat no processed sugars at all. Instead, sugar should come from a wholefood diet such as grains, fruit and natural food. The American Heart Association recommends most women get no more than 24 grams of added sugar per day. That’s about 6 teaspoons (or 100 calories) – a little less than the amount in one can of soda. However, the average American woman eats more than 18 teaspoons of sugar every single day. And exercise? Sorry to break the news but current medical opinion stresses that unless the exercise is extreme and the food is eaten directly afterwards, it is has little effect on blood sugar. Horrified about the thought of giving up the sweet stuff? There is good news on this front. Forsaking sugar doesn’t have to be a miserable and tasteless existence. Neither should it give you the shakes, destroy all hopes of comfort food or take away the promise of chocolate. Rather, kicking the sugar habit should kick your mood and energy through the roof. So here are my tips to kick sugar without hating your life! Drink water: Sometimes, those sweet cravings are actually a sign of dehydration. So, instead of sugar-laden beverages, opt for filtered water, coconut water or green tea. Read the ingredient labels: Sugar is hidden in unlikely foods, from salad dressing to deli meats. Do a quick scan of the the ingredients and don’t just look for sugar – it’s often disguised as glucose, evaporated cane juice, high-fructose corn syrup (HFCS), fruit juice concentrate, agave nectar, fructose, dextrose, caramel or syrup. Switch to low GI foods: Low GI (Glycemic Index) foods, like whole grains and nuts, release glucose more slowly and steadily. This avoids the drastic spike and crash normally associated with sugary ingredients. The crash makes you crave even more sugar, thereby creating a vicious cycle. Have a pre-meal: Eat a protein-based snack like hard boiled eggs, or an apple with a dash of almond butter, before hitting a party. This will keep you from making bad choices later in the night. Experiment with spices: Not all spices are hot. Many – like cinnamon, nutmeg and cloves – will add natural sweetness to your food. Certain spices, such as cinnamon, will also help to lower the blood sugar. 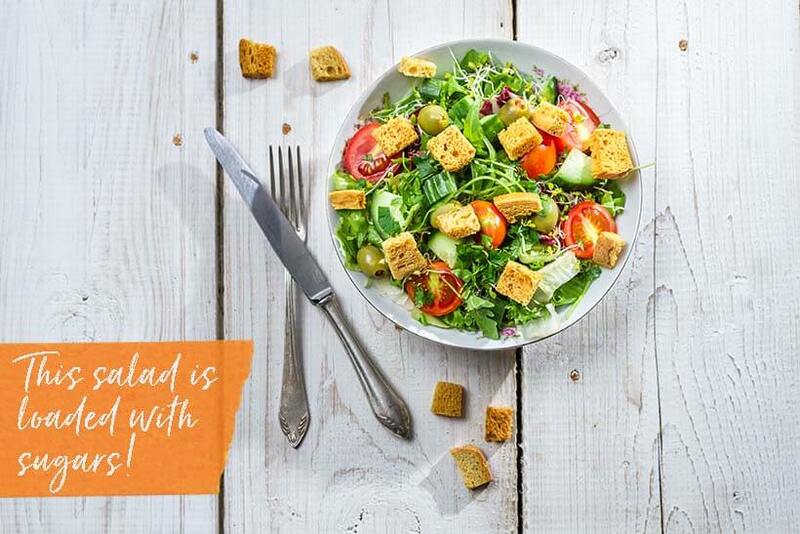 Eat every 4 hours: Fill up on healthy foods at periodic intervals so you are able to maintain stable blood glucose levels and don’t get have sugar-rich cravings. The more you eat sugar, the more you’ll crave sweet stuff. Go easy on the booze: Alcohol is metabolized as pure sugar. Plus it makes you hungry, likely to overeat and prone to making poor choices. So, try to cap it at 2 drinks and drink water between refills. Rid your kitchen of sugar: Throw out or give away any foods in your kitchen that contain added sugar. Out of sight, out of mind! Relax: Because when you’re exhausted or sleep deprived, the body craves sugar-laden carbohydrates. Slow down: For many of us, sugar has become an emotional crutch, a comfort zone, a reward or a way to relax. Instead of falling upon this sweet poison, slow down and decode your cravings. Identifying the real need behind the sugar is the key to kicking your sugar habit for good. Go gourmet: If you simply have to indulge, stick to dark chocolate or truffles over high sugar candies. When baking, use unrefined sweeteners such as natural honey, molasses or maple syrup. You slipped up… now what? However, if you are like me and are reduced to tears with the mere thought of a life lived without chocolates and cupcakes, there is still some hope. What we need is moderation in our diet along with products that can neutralize sugar’s damaging effects on the skin. And the beauty industry is fast coming up with solutions. Green tea has been proven to significantly thwart the glycation process while boosting the production of collagen. So, whip up a green tea infused skincare mask at home, or try one of these: 100% Pure Jasmine Green Tea Moisturizer and Origins RitualTea Matcha Madness Revitalizing Powder Face Mask . With glycation being a major cause of premature ageing, an increasing number of anti-aging creams contain AGE fighters as well. Top options: Skinceuticals A.G.E. Eye Complex, AmorePacific Time Response Skin Renewal Serum and Olay Regenerist Regenerating Serum. Besides this, load up on your antioxidants (look for vitamins A, C and E, superoxide dismutase, flavanoids, beta carotene, selenium, zinc and glutathione). These are the skin’s ‘scavengers’, literally mopping up free radicals. Find them in products like Clinique’s Super Rescue Antioxidant Night Moisturiser and Juice Beauty Antioxidant Serum . How much sugar are you consuming on a daily basis? « How to score the best beauty samples… every time!